Today is chobok (초복), marking the first of boknal (복날), which are the three hottest days of the year by lunar calendar. Although chicken is popular in Korea all year long, samgyetang (삼계탕; hot chicken soup with traditional medicinal herbs, including ginseng) is the most popular boknal dish. My guess is that only a turkey on Thanksgiving would understand how a chicken on boknal feels. You might understand the concept of yi yeol chi yeol (이열치열; to relieve heat with heat) and accept the Korean custom of eating hot food in the summer. Even then, if you just can’t take a big bowl of hot chicken soup on a hot sticky day, here is an option for you. Chogyetang (초계탕) is a chilled chicken soup originated from the northern regions of Korea (which falls in the territory of North Korea). The name comes from the soup’s main seasoning of vinegar (식초; shik cho) and mustard (겨자; gyeo ja, but pronounced as gye ja with the regional accent). 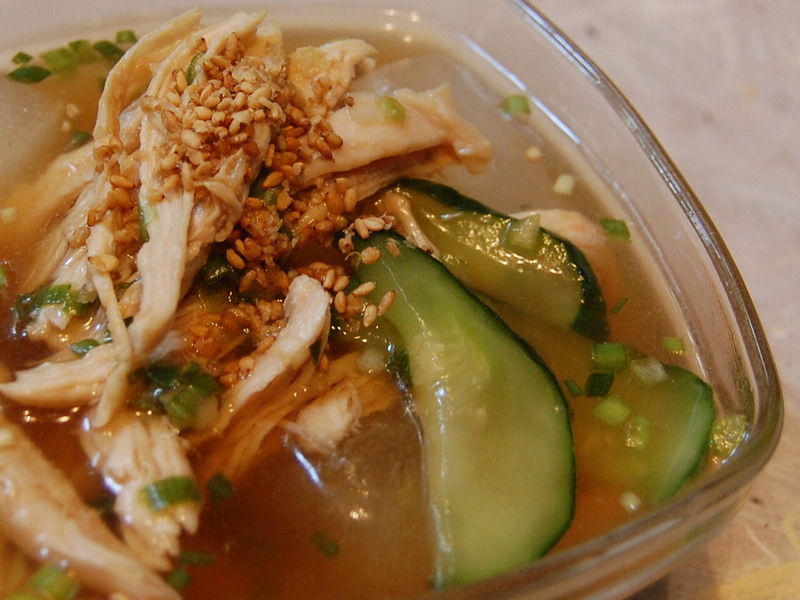 While it is not as well known as other chicken dishes or summer dishes of Korea, the chilled, tangy broth with well seasoned chicken makes it a great dish that is sure to revive your appetite on a hot summer day. For a light meal, buckwheat noodle (메밀면; me mil myeon) is often added to the broth, which can be a nice alternative to naengmyeon (냉면), arguably the most popular cold noodle dish in the summer. For me, a smaller portion with just chicken and crunchy cucumber garnish without the noodles makes it a cooling summer appetizer. I learned that a proper chogyetang made with some 25 herbs and vegetables was worthy to be part of the royal court cuisine. Even for a simplified version, it would take a few more steps to make this dish if we didn’t already have chicken stock and shredded chicken meat chilled in the refrigerator as part of eating away a whole chicken. Now, you can leisurely make it yourself at home with this simplified version of chogyetang. If frozen, defrost 4 cups of chicken stock in the refrigerator overnight. Strain chicken stock for clear broth base. Add 2 tsp. of soy sauce, 1/4 tsp. of salt, 2 tsp. of vinegar, 2 tsp. of sugar, juice from 1/2 lemon and stir to mix. Adjust seasoning with salt to taste. Keep in the refrigerator. If frozen, defrost 1 cup of shredded chicken breast meat in the refrigerator overnight. Mix 2 tsp. of soy sauce, 2 tsp. Dijon mustard, 2 cloves of grated garlic, 1 finely chopped scallion stem, 1 Tbsp. of fresh grated ginger, 1 Tbsp. honey and fresh ground black pepper to taste. Cut 1 short cucumber (I used one Kirby cucumber) into half-moon slices and mix with 1 Tbsp. of sea salt. Let rest for 30 minutes or until the cucumber slices have wilted slightly. Wash off salt in cold water, drain well, then refrigerate.